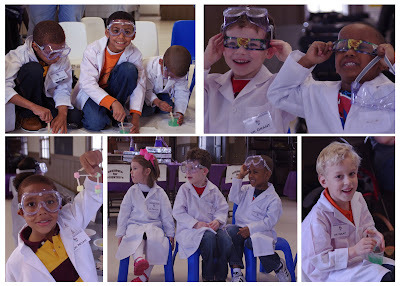 The theme for this year's blowout birthday party for my boys was science. I don't quite understand the allure of dissecting small animals and mixing up chemicals, but they seem to dig it. So I did my best to play along and tried to create a great event for my budding scientists. The invitation was a little involved. 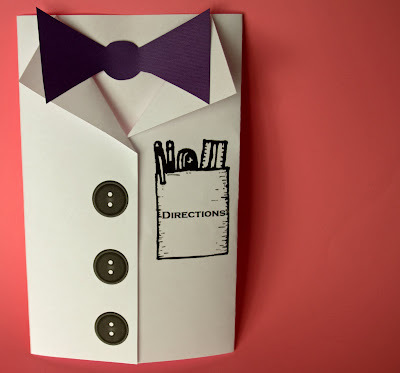 I first created a basic invitation on vellum paper with a background image that was printed on regular printer paper. 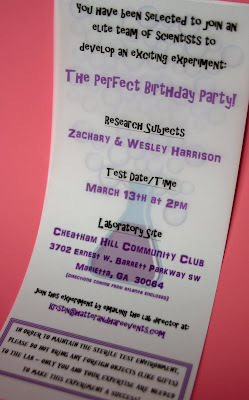 By the way, the background image is an Erlenmeyer flask - interesting fact #1 that I learned while planning this party. I then rolled up the invitation and put it inside a giant test tube that I found here. 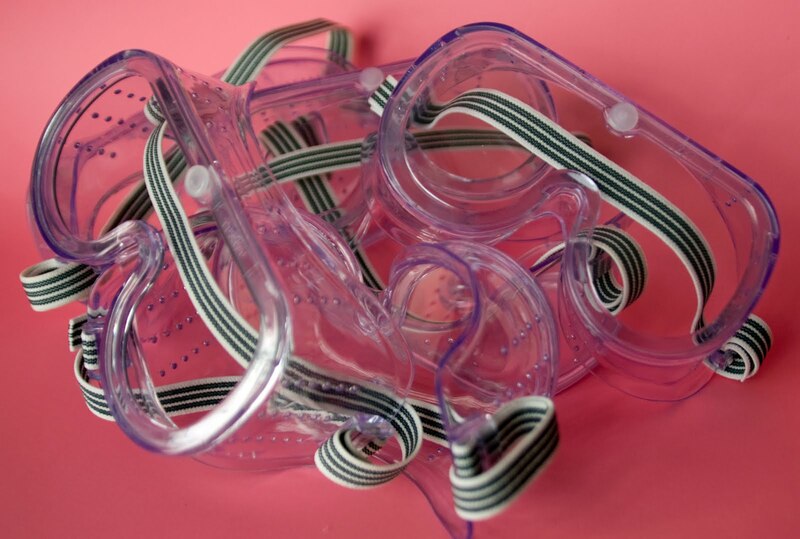 Interesting fact #2: these plastic tubes are actually used to create two liter soda bottles - who knew? 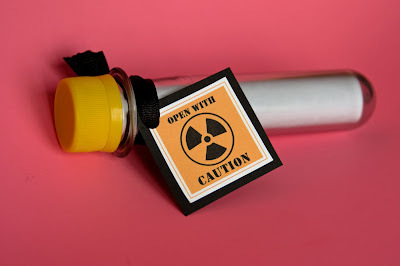 The really cool "caution" labels were created by Amy Locurto - you should check out her blog when you get a chance. The last part of the invitation was a direction card - the party was held in a kind of obscure location, so I played the role of GPS. I might have mentioned that I get a little obsessed with themes, so when I started typing up the directions this happened - another white lab coat! Here are some pics from the actual event - if the smiles were any indication of their satisfaction, I think the kids had a great time. 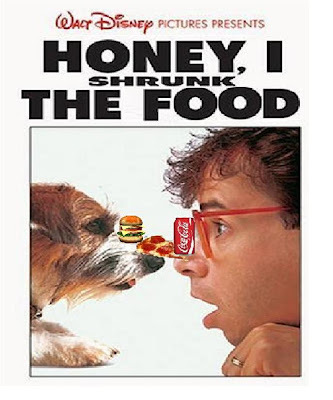 I wanted to have a little fun with the food, so I drew inspiration from the movie "Honey I Shrunk the Kids". The basic premise of the movie is that a crazy scientist invents a machine that miniaturizes things, including his kids. 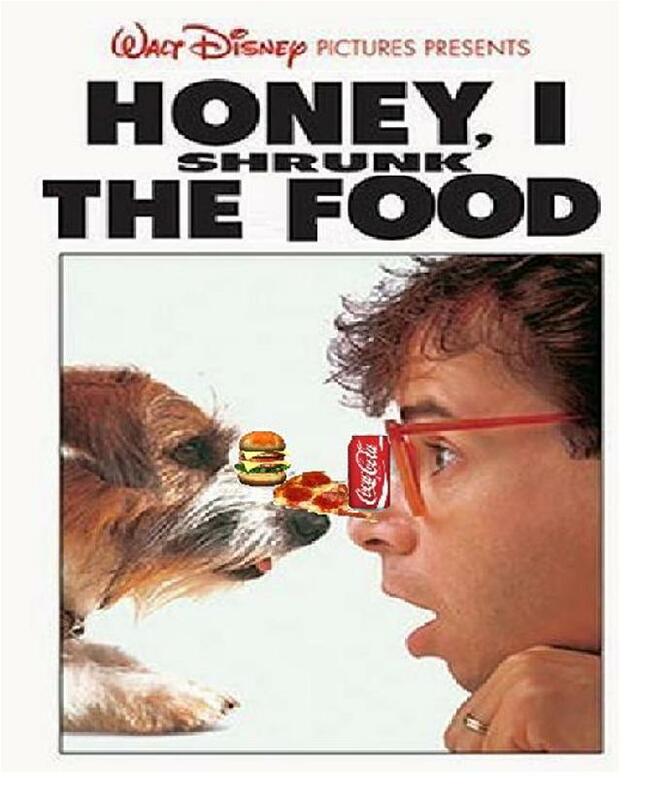 For the party I altered the original movie poster and served all miniature food - sliders, mini tater tots, bagel bites (which looked like mini pizza),baby carrots, etc...too fun! So the last interesting fact that I learned from planning this party is that science is pretty cool - I'm off to pick up my own lab coat right now! So fun! 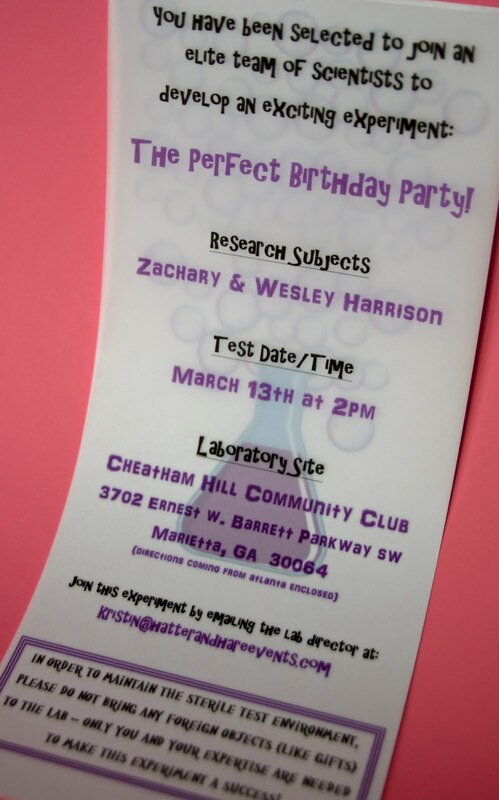 I love the invitations in the test tube! And I know several budding scientists that might love this party. 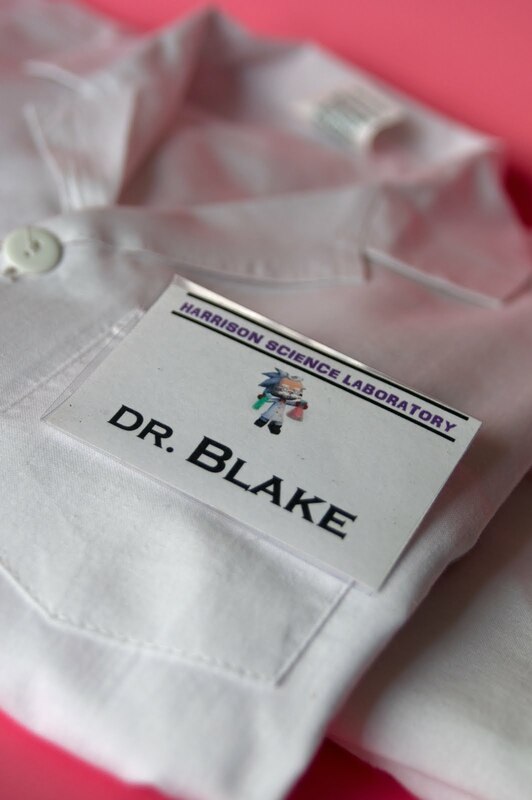 Love the lab coats with the name badge, this idea adds a lot of authenticity to your MAD SCIENTIST PARTY THEME. Would love to know the activities. It looks like you were constructing molecules and possibly slime? It's a superb way to inspire a career in science. Did you do anything with dry ice? We have some tips for handling dry ice. Thanks Kendra...the extra postage to mail the invitations was well worth it - the kids loved the test tubes! Hi Christine! I conducted what I called a "Scientist Readiness Course" that included creating molecules out of marshmallows, guessing elements from the periodic table and reciting famous scientific formulas. I would love to take credit for the experiments (you called it - slime and dry ice), but I hired an incredibly cool company that specializes in science parties - they are here in GA, but I've heard about similar companies in other states. One other fun thing I set up was an "Invent Your Own Sundae Bar" - needless to say this went over big.